No matter the time of year, or region and climate that you live in, getting a skin cancer screening test should be at the top of your annual health checkup list. The evidence surrounding skin protection is overwhelming in its support of regular skin cancer screenings, so make sure you have your appointment booked. A screening is simple and relatively quick, but to make the most of your visit to your dermatologist for a full skin exam, there are certain things you can do ahead of time to prepare. It is important to make a note of any new skin lesions that you have noticed or lesions that have changed. Certainly,moles that have started to itch or bleed are important to point out to your doctor. When thinking of which lesions to specifically point out to your dermatologist, keep in mind the ABCDE’s: Asymmetry, abnormal Borders, multiple Colors, Diameter greater than 6mm (although smaller lesions should also be noted), and Evolution/lesions that are changing in any way. Be aware of certain things that can distort the appearance of your skin lesions. Self-tanner/spray tans 1-2 weeks prior to your skin exam are not recommended,as they alter the color and pattern of certain lesions. It is crucial to remove your makeup prior to your exam. It is impossible to thoroughly examine your lesions with makeup covering them. Feel free to ask for face wash when you get to the office if you must wear makeup earlier in the day. We are always happy to provide this for our patients. It is ideal to remove fingernail and toenail polish prior to your exam. Concerning conditions, such as melanoma, can be found in the nail unit, and, therefore, it is best to allow for proper examination of these areas by removing the polish. Also, if you are concerned about a potential fungal/bacterial infection of the nail, it would not be able to be effectively diagnosed with polished nails. It is also useful to know that while many people think that applying moisturizer prior to a skin exam is prohibited, this is not the case at all! Feel free to moisturize your skin as per your normal routine. In fact, proper moisturization actually helps to normalize the pattern of your skin lesions. Please be aware that your dermatologist can only examine what he/she can see. If you are wearing clothing or undergarments, your dermatologist may move them to the side, but this would still prevent a proper examination of the skin. To note, if you have tattoos, your dermatologist may take more time examining these areas, as the tattoo pigment can mask skin lesions. We hope these tips help to prepare you for your next skin exam so that you will have an efficient and positive experience! As you can see preparation is as simple as the screening itself. 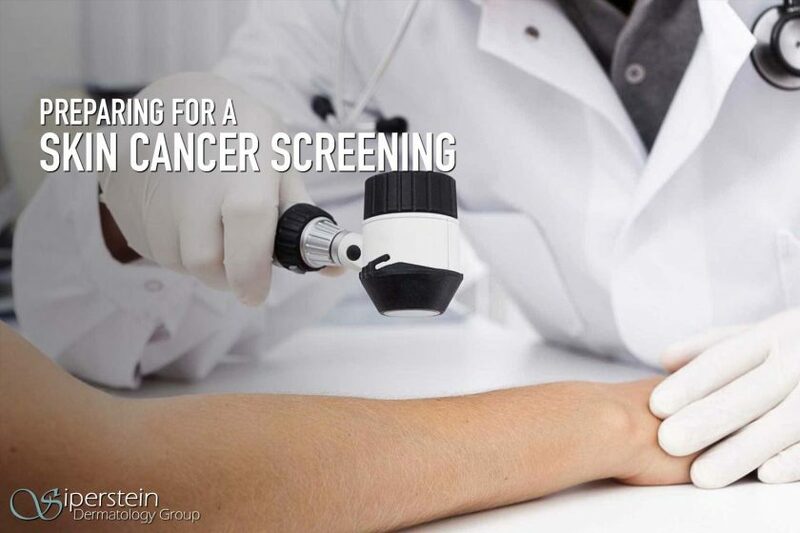 If you would like more information on skin cancer screening, or you would like to book a full body skin check with one of our highly qualified, board-certified dermatologists, please contact us for an appointment.